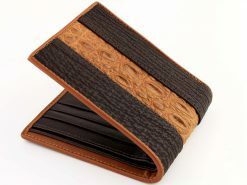 Genuine croc skin wallets like this gem are always a popular choice. Finished in black to showcase the unique pattern of this timeless classic wallet, we’ve added an ostrich interior in a contrasting wicked red to set it apart from the rest. Get any of these croc skin wallets for men and make your mark on the rest of the crowd.This one belongs on show, it ain’t gonna work in the back pocket.